You've now added Spinalonga (Kalydon) to your itinerary. Kick off your visit on the 9th (Mon): enjoy the sand and surf at Stalis Beach and then head off the coast to Spinalonga (Kalydon). To find where to stay, maps, and more tourist information, read our Heraklion custom trip planner. Singapore, Singapore to Heraklion is an approximately 22.5-hour flight. Traveling from Singapore to Heraklion, you'll gain 6 hours due to the time zone difference. Expect a bit cooler temperatures when traveling from Singapore in October; daily highs in Heraklion reach 27°C and lows reach 20°C. Cap off your sightseeing on the 10th (Tue) early enough to catch the ferry to Kamari. Kamari is a coastal village on the southeastern part of the Aegean island of Santorini, Greece, in the Cyclades archipelago with a population of approx. 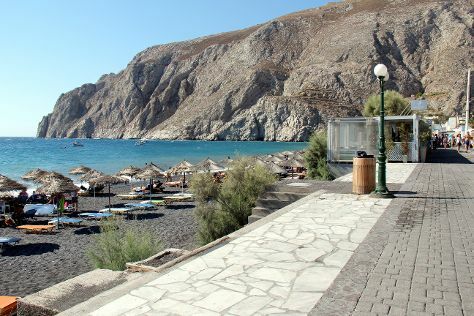 Go for a jaunt from Kamari to Oia to see Amoudi Bay about 40 minutes away. There's much more to do: explore the ancient world of Akrotiri, enjoy the sand and surf at Red Beach, learn about winemaking at Venetsanos Winery, and tour the pleasant surroundings at Perissa Black Sand Beach. For reviews, traveler tips, ratings, and more tourist information, go to the Kamari vacation planner. Traveling by ferry from Heraklion to Kamari takes 2 hours. October in Kamari sees daily highs of 26°C and lows of 20°C at night. Finish up your sightseeing early on the 13th (Fri) so you can travel to Mykonos Town. 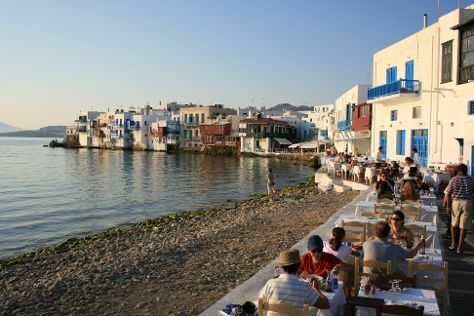 Mykonos Town is known for historic sites, sightseeing, nightlife, beaches, and museums. Your plan includes some of its best attractions: get a taste of local nightlife at Little Venice, examine the collection at Aegean Maritime Museum, kick back and relax at Elia Beach, and take in the spiritual surroundings of Paraportiani Church. For more things to do, where to stay, maps, and tourist information, go to the Mykonos Town trip itinerary planner. Getting from Kamari to Mykonos Town by combination of taxi and flight takes about an hour. Other options: ride a ferry. Expect a daytime high around 24°C in October, and nighttime lows around 20°C. Finish your sightseeing early on the 16th (Mon) so you can travel to Athens. Athens is known for historic sites, museums, sightseeing, shopping, and nightlife. Your plan includes some of its best attractions: take a stroll through Plaka District, kick back and relax at Glyfada Beach, see the interesting displays at Acropolis Museum, and delve into the distant past at Temple of Olympian Zeus. To find maps, more things to do, other places to visit, and more tourist information, read Athens online itinerary creator. Getting from Mykonos Town to Athens by combination of flight and subway takes about 2.5 hours. Other options: ride a ferry. October in Athens sees daily highs of 27°C and lows of 17°C at night. Cap off your sightseeing on the 20th (Fri) early enough to travel back home.